Appetizingly balanced, rich and peppery with a comforting warm, soothing finish. Before the intense distilling process begins, Hudson will source up to 90% of the grains that go into the Four Grain Bourbon from within ten miles of the distillery. They support local farmers and a greener planet. 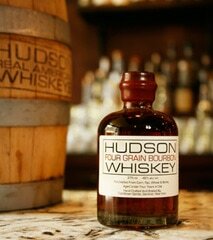 Better-tasting, low-yield heirloom grains mean better tasting whiskey. Good grains in. Great whiskey out. This special bourbon is aged in petite new American oak barrels for more wood contact, giving it more depth, character and a warm, soothing finish.